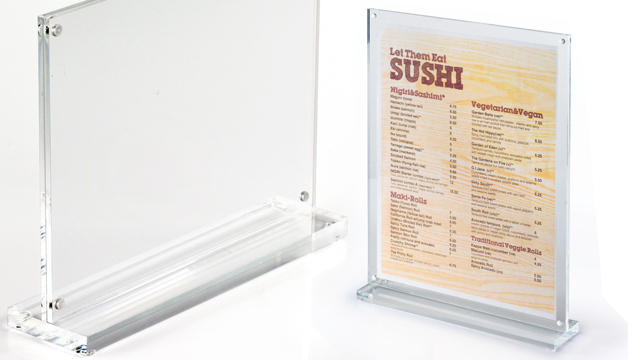 These stand up sign holders display contents through clear acrylic. 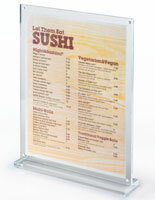 Each frame can be used in homes, bars, retail environments, tradeshows, and many other locations. 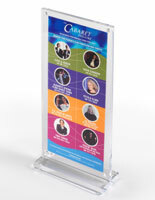 These stand up sign holders that are 5” x 7” have the ability to present drink specials, family photos, brochures, sales, store information and much more. Each of these picture frames, stand up sign holders, can be used in a variety of locations to hold many different kinds of materials. This enclosure sits upright on tabletops due to its t-shaped construction. 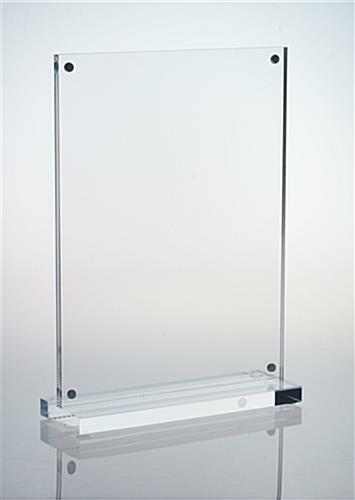 These t-shaped stand up sign holders feature a design that further contributes to the frame’s versatility of use. 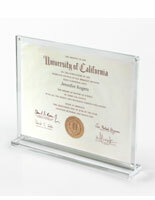 Each unit is equipped with a rectangular base that holds up the acrylic frame. 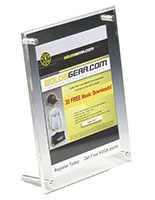 These 5x7 stand up sign holders have two 3mm thick acrylic panels that are held together by small magnets. To put a photograph or other image in the frame, simply move apart these two sides and place the picture inside. These stand up sign holders that hold photos are used in portrait orientation only. Any material that measures 5” by 7” or smaller may be used with this enclosure. 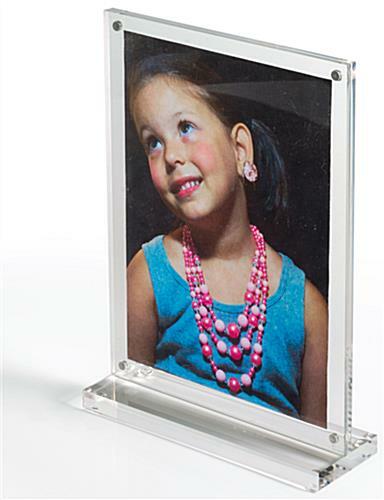 These stand up sign holders, also known as photo frames, feature a base that is 10mm tall and 50mm wide. This base allows the stand to be steady when standing upright. 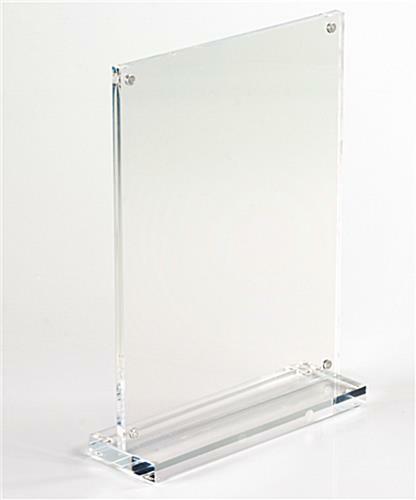 These stand up sign holders that have a t-shaped base are ideal for holding photos and other materials in a variety of public and private locations. 5.9" x 8.3" x 20.0"
5.9" x 0.5" x 2.0"
These sign holders met my needs. They seemed a little more sturdy than ones I have purchased in the past. Thank you, that is great to hear! Thanks for the excellent review. I received my acrylic sign holders, and they were even better than I expected! 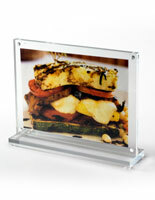 They are high quality, and displays my pictures so beautifully. If you are in the hunt for a high end classy looking sign, you have found it. Fast shipment and great USA customer service. Thank you!! Thank you for the review, Nico. If you are planning on ordering from us again, feel free to like us on Facebook; we offer various social media-exclusive discounts and deals that you may be interested in for future orders! 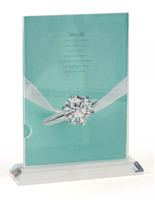 very nice looking lucite with a heavy base. The magnets are also great! I tried putting more 5 pieces of paper and it held no problem. Items were received in good order due to professional packaging to ensure no breakage or scratching occurred. The shipping was very prompt from order time. I enjoy doing business with vendors like this who are focused on customer service.